As a child I remember learning my hundreds, tens and units and then moving onto decimal places, thousands, millions etc… well it would seem to that we are there with J. For this week’s 2nd grade post and the theme leaves we’re working on place value, and reading, writing the numbers that are formed. Combining learning place value with the reading and writing of numbers brings additional ways in which a child will recall the place value of numbers and the importance of each place in a number. As we are a creative family I decided it was time to combine some maths with some art so we created our own leaves and used them on a branch to work on the place value and the reading and writing of the 3 digit numbers. 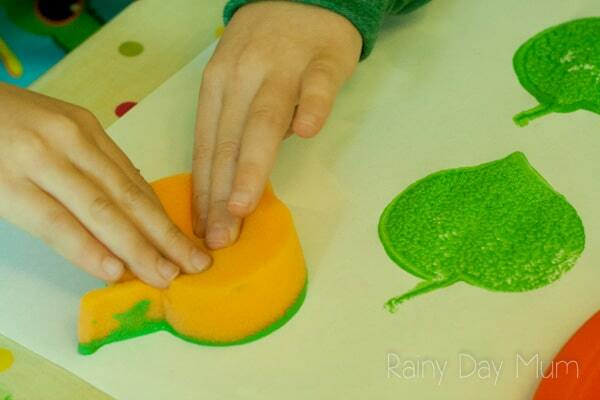 I don’t know about your kids but my kids LOVE printing and getting the paints out so we may have gone a little overboard with creating our prints – however I know that at some point this year or extra leaves will be used. We printed using the Leaf Shapes Sponges [affiliate link] making sure that there was ample space between the prints of the leaves. Then left them to dry, after they are dry cut them out and onto them label them with the numerals 0 – 9. I did 30 leaves in total and labeled them in sets as I know at some point we will be working on higher numbers. 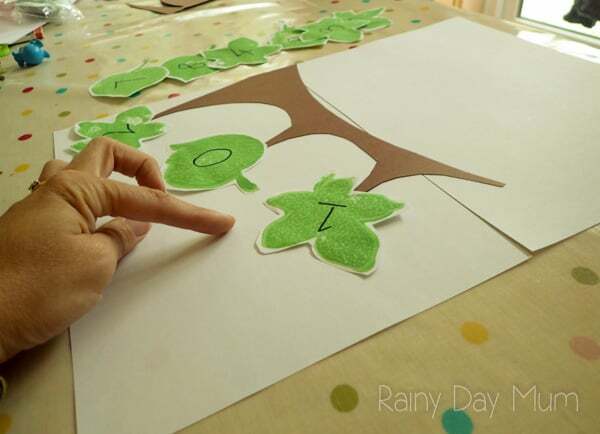 Cut out a piece of brown card to look like a branch making sure that it has 3 places on it for leaves to attach to represent hundreds, tens and unit leaves. 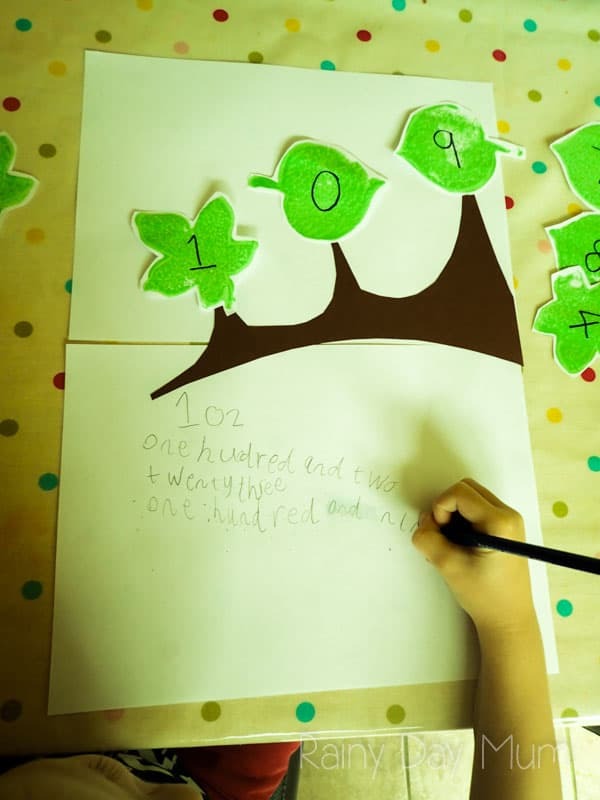 Set out a number on the leaves – I started with 102 and then explain what each leaf told us – the first leaf the hundred number, the second leaf the number of tens and the last leaf the unit number. 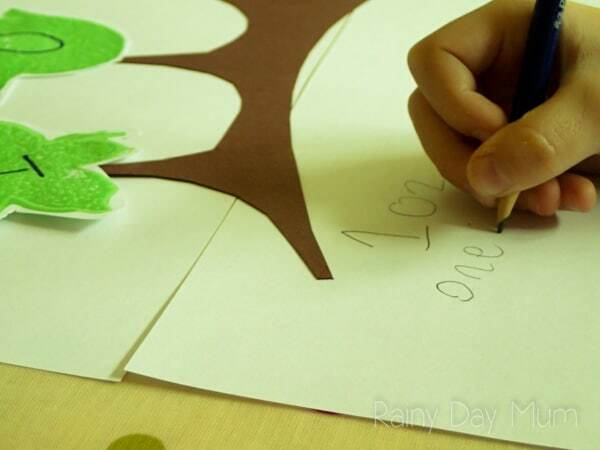 Then ask your child to read the number out loud to you – we first have ” 1, 0, 2″ so to prompt him I said remember the first leaf is one hundred – this prompted the recognition that we were looking at a number starting with 100 and “102” came out straight away. The next step was to write the number below as a number and then in words. This prompted a discussion about it was one hundred than two – not one hundred and two – sometimes having accents really hinders children’s recognition of words and spelling this was one of those situations and provided a great time and opportunity to discuss this misconception that school hadn’t picked up on with him as when he’s saying it – it sounds right. 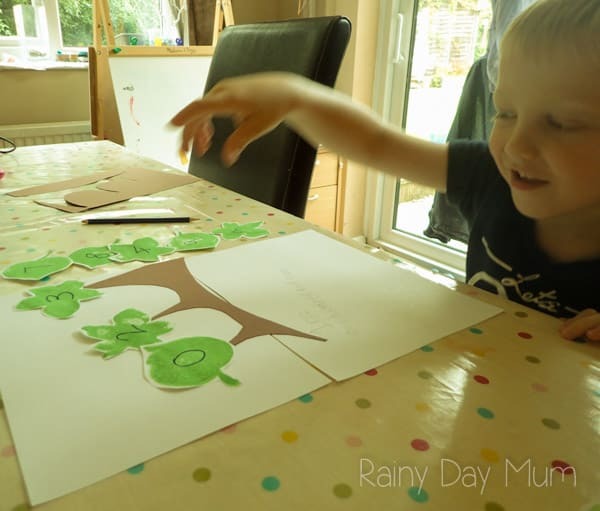 With the next numbers he chose which numbers to go on the branch – the first number he choose was a 0 in the hundred position. I could hear the clocks ticking as he worked out what that meant. “So is this the 1024 or is it just 24!” with some discussion again (I love the activities that give us lots of prompts for discussion and talking about the learning) I explained it was like saying we had 0 hundred and that made sense. He then read the numbers, wrote the numbers and wrote the numbers in words. 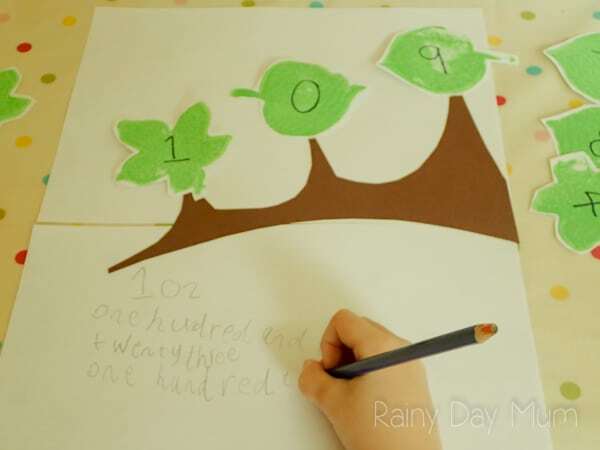 You know your child – if they are at the stage of working at place value of 2 digit numbers then reduce the number of anchor points on the branch and get them to work out numbers up to 99. For older and more able children introduce more anchor points – or a separate branch and add in decimal places on the separate branch. Using the branch you can work on subtracting and adding at place value level – subtracting units, tens, or even hundred. E.G Start with the number 155 – now you subtract or add 1, 2, 3 or 4 and they adjust the unit number. Now repeat changing it for adding or subtracting 10, 20, 30 or 40 and then adjusting the number of 10’s. Check out these other great ideas for leaf based learning from the 2nd grade blogging team. Lovely leaf themed math activity! 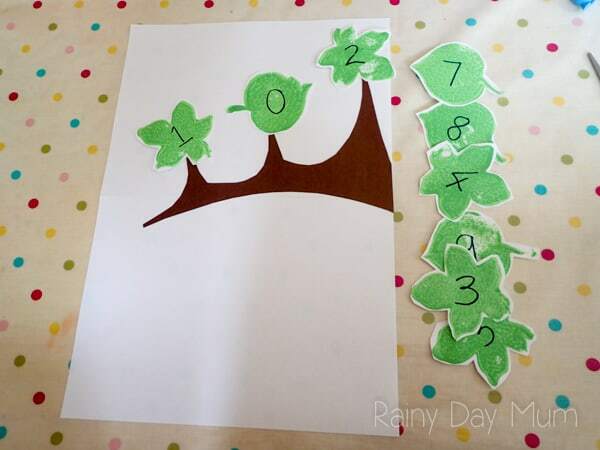 This is SO brilliant to do place value with leaves! I might make this into a display with a pocket chart that stays up all season! This project is very clever! I love how you combined math and art!